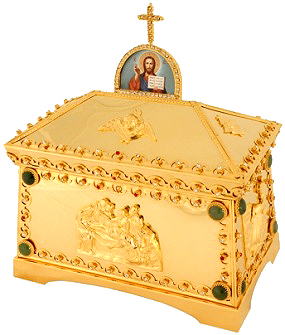 Here at Istok Church Supplies, we stock an extensive collection of beautiful Orthodox Christian reliquaries including Orthodox reliquary crosses, pendants and jewelry reliquary boxes in Russian and Greek styles. These products are offered to help customers preserve ancient liturgical arts and store their most cherished religious belongings. 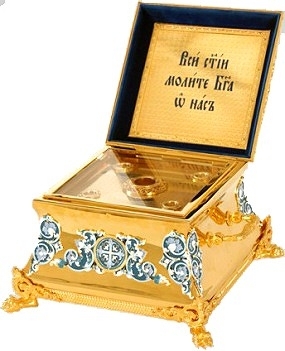 An Orthodox reliquary is an important means of protecting and displaying religious relics. Our traditional reliquaries are made from high quality materials such as brass and feature exquisite gold gilding that enhances their appeal. They come in a wide range of aesthetic designs with some of them featuring colors and natural stones for added beauty. We also offer copper Orthodox reliquary crosses that feature intricate filigree work and silver gilding – a worthy addition to any style of worship in any Orthodox Church. 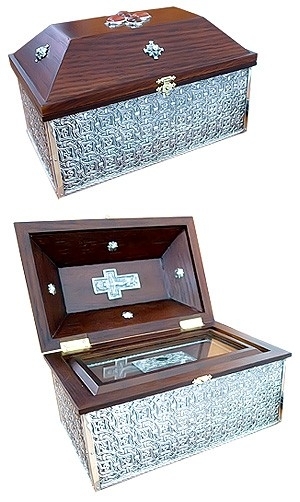 Also on offer are intricately carved Greek Orthodox reliquary boxes. 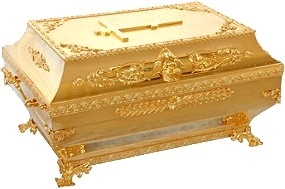 You can find jewelry reliquary boxes constructed from solid wood as well as quality metals such as brass. Some of these boxes are copies of XV century designs and can be counted as heirloom items. 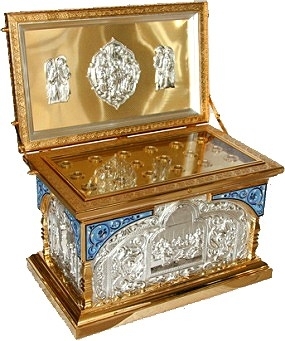 Our master craftsmen work hard to ensure that everything from brass hand casting to gold and silver gilding is executed to perfection so the reliquary piece appears stunning and exquisite. 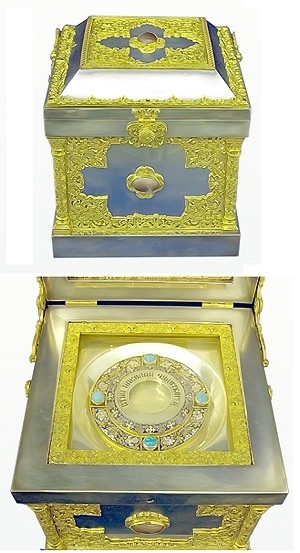 Our jewelry reliquary boxes are available in various shapes including round, square and octagonal. You can find round jewelry reliquaries topped by a cross and featuring handles on the side for easy mobility. 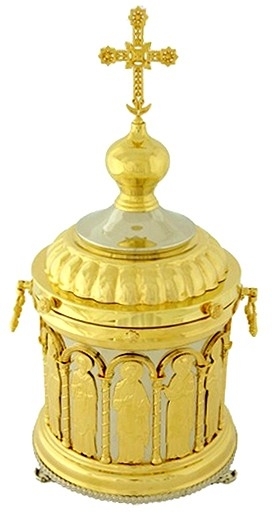 If you are in need of a Russian Orthodox reliquary, we do not disappoint. 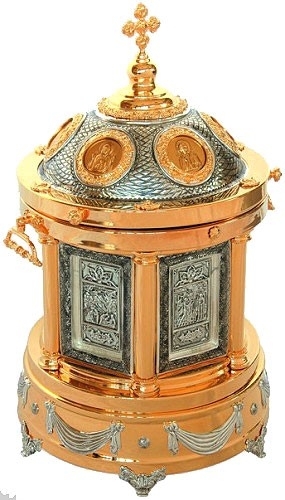 Included in our collection are a broad range of baptismal reliquaries featuring images of venerated Russian icons such as The Holy Great Martyr and Healer Pantheleimon, Holy Venerable Sergius of Randonezh, Holy Blessed Matrona of Moscow to name a few. 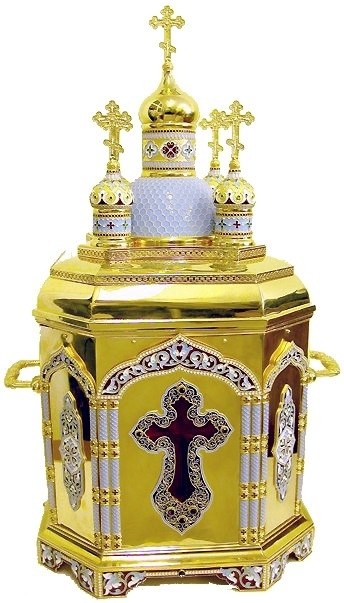 We also provide solid, durable, beautifully constructed reliquary shrine support systems. Our prices are unbeatable in the market and our special offers make our products even more irresistible. Browse through our stunning collection to find something that fits your aesthetic taste, budget and requirements!